Wimborne in Bloom is a completely voluntary organisation run by a small committee. We need to raise around £20,000 a year to provide the plants, planters and hanging baskets. This money also funds a contract with a local firm to undertake the planting and maintenance of some 80 planters around the town along with the watering of all planters and almost 200 hanging baskets. The brand new Wimborne in Bloom Tote Bag, with its unique and distinctive decoration this makes for a cheerful way to carry around small items and shopping. Printed on 5oz natural cotton, each bag is 380 x 420mm in size, with two sturdy shoulder length handles. 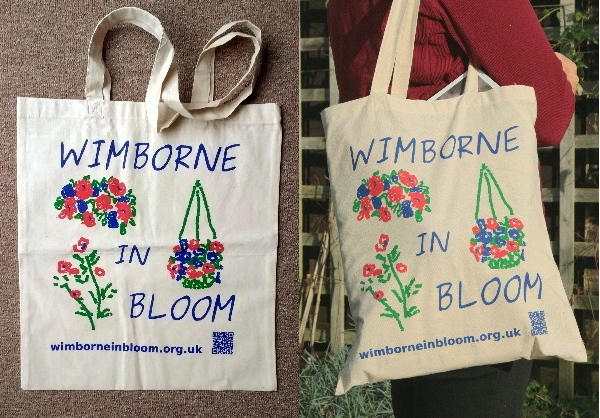 The bags are on sale for £5.00 each at all 'In Bloom' events or can be purchased at 'La Cantina' on Church Street, Wimborne, or direct from Julia (Tel. 07968 367315). All proceeds from the sale of these bags go towards 'In Bloom' funds.